Andy Roddick called for a press conference at 6pm (New York City time) at the US Open, announcing his retirement. The news surprised many, but Roddick was at terms with his decision. Making the difficult choice on his 30th birthday, the American addressed the media and press in a 20 minute discussion. “I have decided that this is going to be my last tournament,” said Roddick, who is guaranteed an emotional reception on Arthur Ashe Stadium on Friday night when he plays Australia’s Bernard Tomic for a place in the last 32. 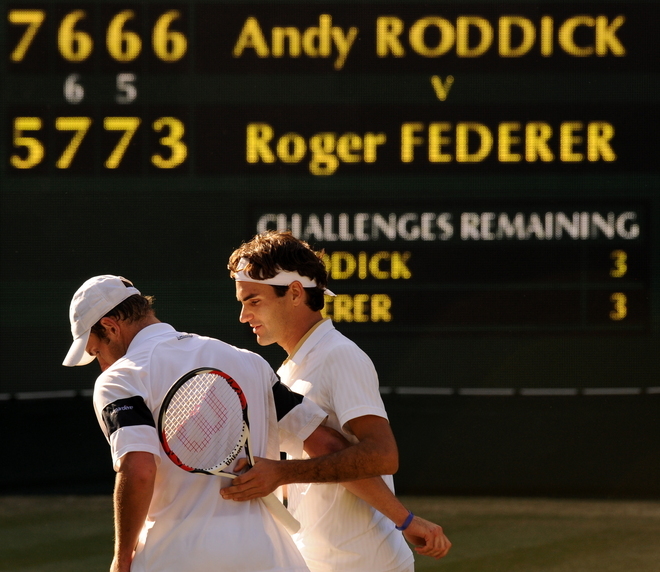 Roddick, whose ranking is now down at 22 in the world, lost to Federer in the Wimbledon finals of 2004, 2005 and 2009. Long time rival, Roger Federer reflected on Roddick’s retirement in his press conference after defeating Bjorn Phau Thursday night. “Andy’s a great man,” Federer said. “I had some great battles with him for a long, long time and all the Wimbledon finals come to mind. We had some epic battles over the years. Roger Federer on Andy Roddick in press conference. Roger Federer and Andy Roddick faced off in four grand slam finals (Wimbledon 2004, 2005, 2009; US Open 2006). While the Swiss won all four encounters in slams and dominated the head to head in their rivalry, Roddick poured his passion and his full efforts in each match. Their meeting in the 2009 Wimbledon final will likely be remembered as one of the most emotional, gut-wrenching matches of all time. Andy Roddick will be missed in tennis. For FedererFan07, I wish him the best of luck in his future off court, in his foundation, new radio show, and beyond.